One of the lovely things about putting all my patterns into the same format is that I get to revisit them all, double-check that I've seen everyone's FOs, and marvel at the skills and creativity of my fellow knitters. Today I want to share a handful of major beauties that came out of An Aran for Anne, the companion pattern to my all-spiffed-up An Aran for Frederick. 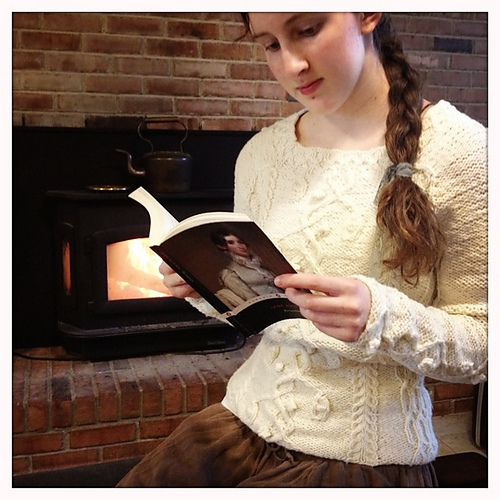 Knitwitted knit hers before embarking on a trip to the British Isles. 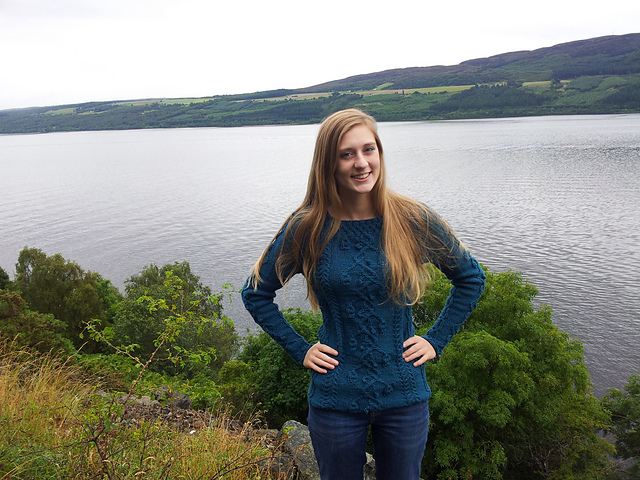 Here she is on the shores of Loch Ness! Extra length on the sleees and body gave her the fit she was looking for. Remember: You are the boss of your own knitting. Modify so you'll love and wear it after all your hard work? Lea67000 chose a beautiful color for hers and added a hem after the fact. aaafan achieved a gorgeous fit on hers. Knowing your measurements can make all the difference when choosing which size to knit. And don't be afraid of a touch of negative ease! How charming is the photo shoot WildBerryKnits staged for her sweater?! Reading Persuasion by the fire, hair caught up in a lace ribbon... Love it! One more lovely version, this one from ktrautlein.